Picking up where I left off yesterday–my heroic quest for the right color of flower thread. 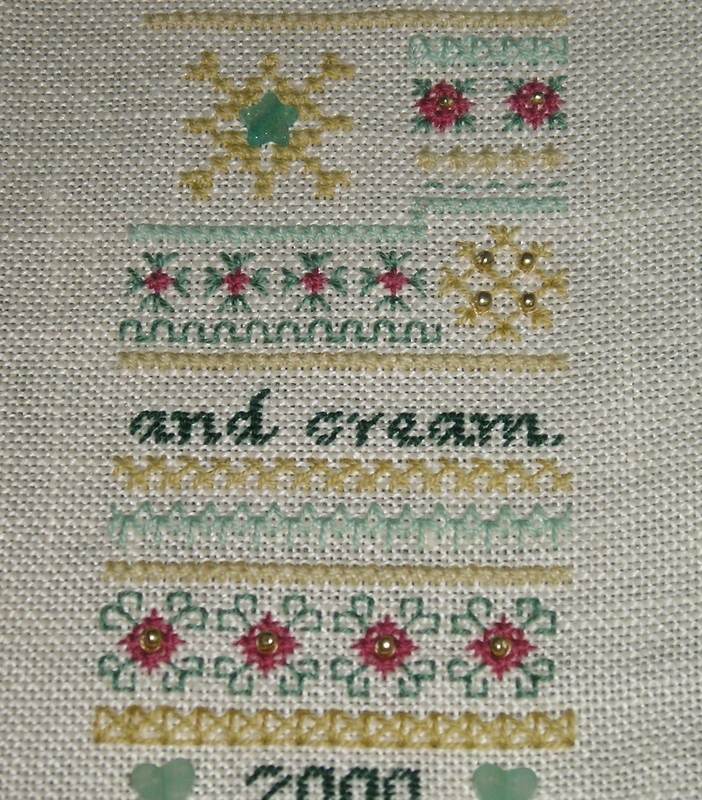 I offer in evidence this detailed photo of the bottom third of the sampler. To my eyes, the lightest green seems disproportionately lighter and mintier (bluer) than the medium and dark green (used for the lettering). What do you all think? The mintier light green matches the star and hearts charms very well, but I still don’t like it. And you can’t make me. 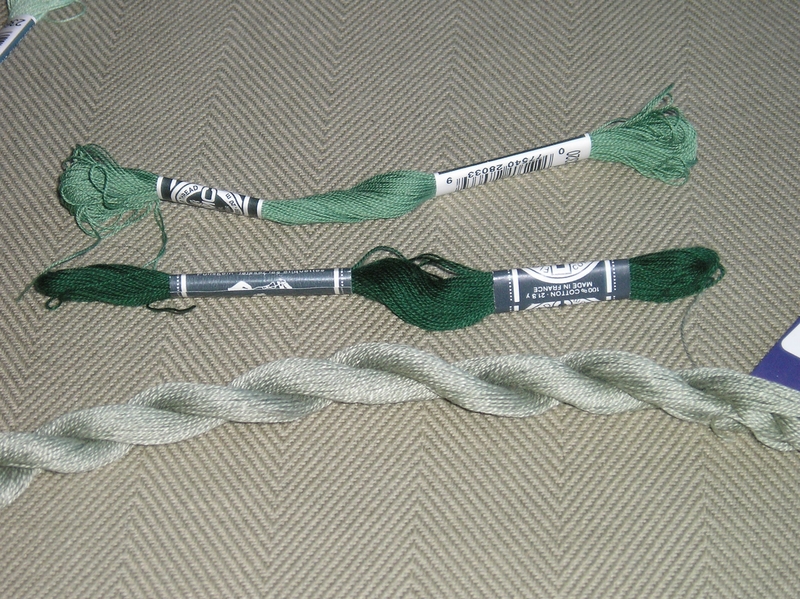 The problem is that with the flower threads being discontinued, I have no way of finding out if there’s a suitable substitute so I can redo the lightest green (2369). You can see the called-for threads in the picture on the right. Ginnie Thompson has so far been unresponsive to my requests for a color card or even a conversion chart to DMC flower threads. As I mentioned yesterday, their site offers a conversion chart to DMC embroidery floss, but that’s not the same thing, is it? If the DMC flower thread 2369 actually matched the color of the DMC embroidery floss 369, as it’s ostensibly supposed to, I wouldn’t be unhappy with the color. 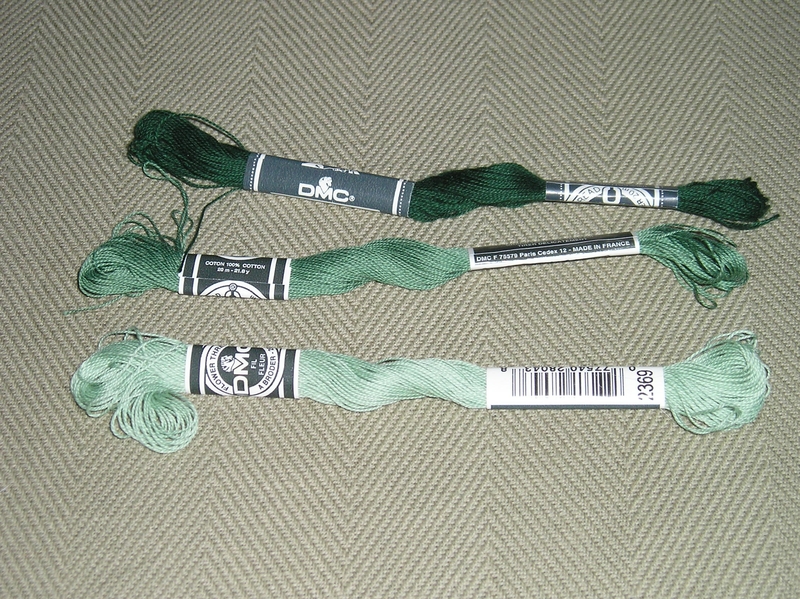 The embroidery floss color is a little darker and less minty green–just what I want. Sigh. The closest approximation that I’ve found is actually this Caron Wildflowers, #5004 (see photo on left). I tried DMC Perle Cotton and Medicis Wool, but they either weren’t the right color or they weren’t the right texture. Although the Wildflowers is a bit grayer than I’d like, and a bit thicker, I might just go with it anyway since it has that matte flower thread cotton feel. What have I got to lose? I’m unhappy with the sampler the way it is, and the situation can only get better, right? 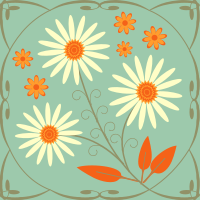 Previous Post Where Have all the Flower Threads Gone? Thanks, Kathy! That was very helpful. I will have to check out Danish Flower Thread as well. There’s something satisfyingly simple about flower thread that I like very much. It “pops” off the fabric nicely. I’m working a couple stockings in perle cotton and it has much the same effect. Thanks for stopping by, and thanks again for the tip!